Cadillacquer She's One Of A Kind - Polish This! The other day I needed something quick but still pretty on my nails. 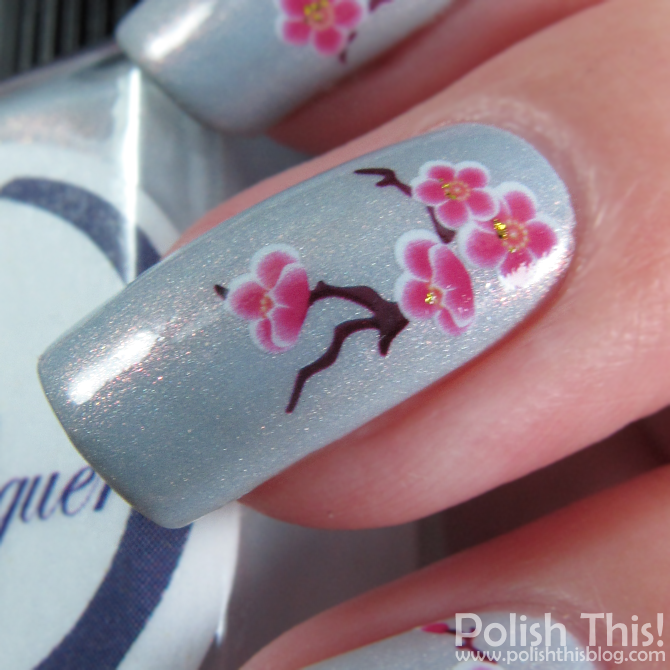 The best recipe for those kind of situations is really simple: a gorgeous polish and some pretty water decals (preferably good quality decals that you know will work as they should) and that's the exact recipe that I went with once again. I've somehow forgetten to try Cadillacque She's One Of A Kind eventhough I have had it quite a while now. When I realised that I had to fix it immediately and wear it. I had this quite a while on my wishlist and when I finally got it, I forgot to use it... Oh those nail polish blogger problems. Anyhow, it's truly a gorgeous polish and I'm really happy to own it! She's One Of A Kind has a light greyish blue base with magenta shimmer and very subtle holographic effect. This has the type of shimmer in it that I'm always completely in love: it's quite subtle looking but you can still see it on your nail too, love it! I thought this might be quite sheer as the color is so light, but to my surprise this covered perfectly with just two coats, so that's really another reason to love this polish even more. Like I said, I needed something quick on my nails, so I decorated them with just simple water decals. I used half of these decals already in this gradient over a year ago, so I knew these were good quality ones and they didn't disappoint me this time either. Just look at that shimmer, so pretty! I've said this before, but sometimes the simplest are the best and the simplest manicures work just as well. I wasn't really trying to do anything Valentine's Day related with this manicure, but you know, this suits the theme quite well. I still have my official Valentine's Day mani to do, I started it already and I'll hopefully share it with you tomorrow, so stay tuned! Onpa kaunis harmaa! :) Ja kivat decalit, sopivat hyvin yhteen! Gorgeous! Really simple, as you say, and so elegant.